Weaver Hawkins was born in London and studied at Camberwell School of Arts and Crafts 1910-1914. Following active service in the First World War (which left him without the use of his right arm), he re-learnt to draw and paint with his left at the Bristol Art School, the Westminster School of Art (under Walter Bayes, Bernard Meninsky and Randolph Schwabe) and etching from Sir Frank Short at the Royal College of Art. The Gallery Archive has a notebook on technique Hawkins made when studying under Short. 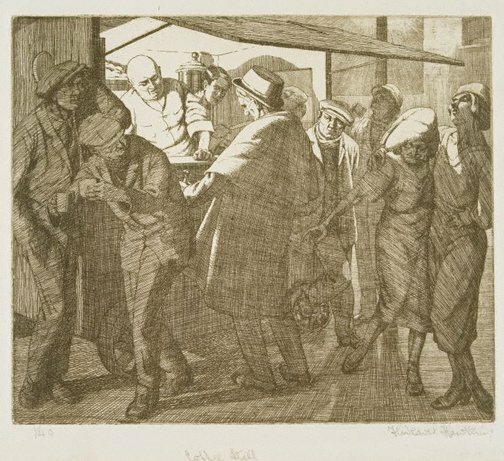 'Coffee stall' was produced while Hawkins was a student of printmaking in 1921. It was exhibited at his first solo exhibition at the Elliott and Fry Galleries, London in 1923. He did not make many intaglio prints, as it taxed his physical strength. While at the school he had an assistant who printed for him, because it was difficult by himself. This led him to experiment with linocuts. Signed l.r., pencil "H Weaver Hawkins". Not dated.